It’s been a while since the last update, but I just can’t help it, the trip across the ocean still breaks me every time. I’m back in São Paulo, enjoying the weather and the amazing food here. And I can’t think of a more appropriate place to write this review, because here is definitely a metropolis. Or maybe a Metropolys, if you let Ystari Games write your dictionary. In all their original games, they managed to sneak in their trademark ‘Y’, and Metropolys is obviously no exception. Besides being written on the other side of the Atlantic Ocean, this review also marks a return to the present day after our recent looks at older games. 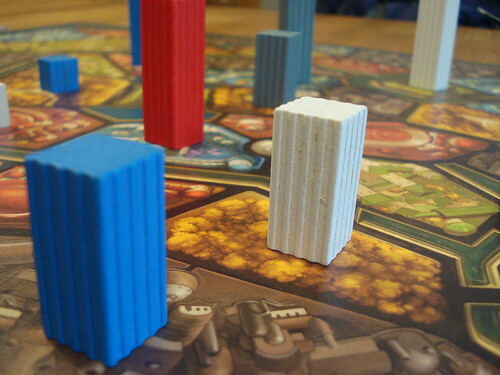 Metropolys was published in 2008 and made it to the Spiel des Jahres jury recommendation list the same year. It’s a quick auction game with a fairly low complexity, especially when compared to other games by Ystari such as the brain-wrecking Caylus, but no less interesting. The city of Metropolys is divided into 5 districts, separated from each other by channels, connected to the others by bridges. You only play in all five districts with four players, for every player short of that one of the outskirts stays unused, until with two players you only fight over the centre and two other districts. Each district consists of a number of neighbourhoods in five different colours and some urban planning extravaganzas – lakes and statues – which will be important in just a few paragraphs. Every district is initially set up with a random selection of markers that highlight some neighbourhoods as extra trendy, as connected to the metro or as archaeological dig sites. Your goal is to leave your mark as an architect on the eponymous settlement, outdoing your competitors in constructing the highest, the most beautiful, the most awe-inspiring towers in the city. Building those towers is obviously no problem, the harder part is acquiring the right to build one in the right neighbourhood. 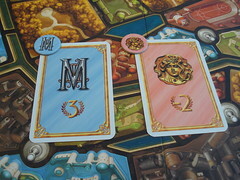 It does sound a bit like the typical bribery in a bureaucracy, but Metropolys plays on a more abstract level than that. 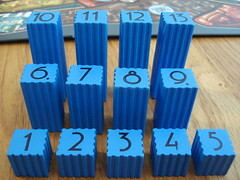 Every player starts with thirteen towers in his colour, numbered from one to thirteen, in three different heights. One to five are the lowest, six to nine medium and ten to thirteen the hightest buildings. 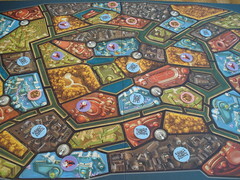 The player that starts an auction puts down one of his buildings in the neighbourhood of his choice, making an offer to the city council to construct that building there. The next player can outbid him by placing a building with a higher number – not necessarily a higher building – in an adjacent neighbourhood. The next player can then outbid him by placing a building with a higher number adjacent to his building, and so on. Bidding continues – always next to the latest building – until all players passed or no one can raise the bid any more, either for lack of a higher building or for lack of an adjacent free neighbourhood. Trendy Neighbourhoods are especially popular with the inhabitants of Metropolys and score three prestige points a piece. Metro connections are the next best thing. If you can’t be trendy, at least you can be connected . Metro markers are worth one point each, and the player with the most of them receives the metro card which is worth three in addition. Like Catan’s longest road, to get the card away from another player, you need more metro markers than she has. Archaeological Sites are the markers you would rather avoid.The Metropolytans are not very fond of people destroying their history, so the markers cost you one point as soon as you pick them up. If that’s not bad enough, together with the marker you receive the archaeological site card, worth another -2 points. At least you may not have to keep this card. Like real people, Metropolytans are only ever bothered by the latest outrage, so the next player to destroy an archaeological site will take the card from you. These markers are some nice – or sometimes not so nice – bonus income on prestige points,but they are neither the only nor the most important source of prestige. The most important source of prestige is the secret objective. Those come in two very different flavours, and which one you chose has a big influence on the game. The first variant is the family friendly game. Here, every player has one simple objective: build your towers next to a statue, a bridge, a lake or the city border to score points. This variant is straightforward, when you bid on a neighbourhood, you know exactly how many points it will score for you, there is no uncertainty about which neighbourhood is more valuable. The second variant, the expert game, is more involved. Now there is not one, but two objectives per player, one of which is straightforward again – build in neighbourhoods of a certain colour for two points per neighbourhood – and the other more complex: you score for formations of multiple buildings. Possible objectives are having a tower at each end of a bridge, having three towers around a statue or a lake, having three towers in the same district or having three towers in a row. Now, if you look at the map you will quickly realise that these objectives are not equally hard. That’s the reason they don’t score equal points, either, scores range from four to seven points. At the end of the game, you still win points for having the highest towers in each district. The expert game is a lot more interesting than the family variant because of the same twist that makes most good auction games interesting: the value of the object you are bidding for is not obvious, changes depending on the situation and is different for each player. Will you try to meet your location objective with neighbourhoods of the right colour to score for both cards? Will you risk the archaeological site marker in the hope of getting the other neighbourhoods you’re missing around that fountain? Should you take this neighbourhood that is worth nothing to you just to prevent another player from getting a cheap chain build? Yes, chain build. Because sometimes, after you win the auction for a neighbourhood, you can get more very cheaply, because the highest bidder may start the new auction. The more the game progresses, the more valuable an opportunity this becomes. If there is a few buildings scattered around already, you can place your towers in a way that leaves one or even multiple neighbourhoods as islands, with no adjacent free neighbourhoods. These are now easily acquired , when you start the new auction you place your lowest value building there and, since there is no space to outbid you, take that neighbourhood, too. These moves are usually quite profitable and can sometimes be used to force a quick end of the game. The game ends as soon as one player places his last building, so instead of leaving you stuck with your towers number one and three, a well timed chain can finish the game while you’re ahead in points. My personal enjoyment of the game differs greatly between the two variants. The family game can feel a bit mechanical at times, you are not often forced into tough decisions, it is easy to assign a value to the neighbourhood in question to determine if you are interested or not. On top of that, not much deduction is required to find the other players’ secret objective, so you also have good information what a neighbourhood is worth to them. This variant really should be played as the name implies: with your family, if there is younger kids present. The expert variant, on the other hand, requires you to make trade-offs between your two objectives, it leaves you guessing at everyone’s goals for longer and adds the competition for the highest tower per district. This variant, while still a game that you can play in thirty minutes and have a good talk on the side, is more interesting, and even leaves you some space for bluffing about your objectives. Both variants share the spatial twist on the simple auction mechanic: you not only want to outbid your opponents, you want to control the direction that the auction is going so you have an interesting neighbourhood in reach on your next bid. By the time that space becomes limited in Metropolys, you should also have an idea about the others’ goals and thus be able to predict where they are going to bid. Or maybe not. The two variants also share the unusual but appealing art nouveau design that is rarely used in games but is used to great effect here and evokes feelings of 1920s-ness and swing music. And while it would have been an option for the towers of different players to have different styles like the manual says they do, they look great just the way they are, and I had fun taking the photos of a Metropolys game in process. For a game as mired in pop culture as Smash Up, it was unavoidable that the internets favorite Old One would have an appearance at some point. But is The Obligatory Chulhu Set as great as the Old One himself, or will it cause your descent into madness? Remember history lessons from school? Yeah, me neither. Too many dates to remember. So how about we just go and mix up history until it matches the answers that we thought were right? Kingsburg is a medieval dice-fest about building up your shire (no, not The Shire, but you can always add a bit of roleplay if you want) and defeating demons and dragons that attack each winter, all through bribery at the court. It seems the ends do justify the means here. Being rich, influential and groomed for political office, that must be such an incredibly boring life. Why is it that the lower classes get all the fun? Well, you’re not going to let them have it without you, and if you have to get rid of your wealth and your good reputation to join them, then so be it. That’s why you and some equally rich and dimwitted friends started the Prodigals Club, a contest of who can most effectively ruin their future. In Kanagawa, all players are disciples of Master Painter Hokusai, trying to learn in his studio of art how to produce visual effects on canvas, capturing the mood of the different seasons as well as specific objects like trees, buildings, characters and animals. And while his wisdom is available to everyone, not every disciple can take away the same learning from the Master. Mighty empires are fighting for supremacy over the ancient world. But where once up to seven empires where in contest, now there are only two. 7 Wonders: Duel condenses the action of 7 Wonders into a two player game, playing in two being the one weak spot 7 Wonders always had. To make that happen, many things had to change, but the game remains the same.